Golden Corral ~ FREE Meal for Veterans and Active Duty 11/17/14! Golden Corral is celebrating is 13th annual Military Appreciation Monday on November 17th from 5pm – 9pm, with a FREE Dinner Buffet and Beverage for all Veterans and Active Duty Military. 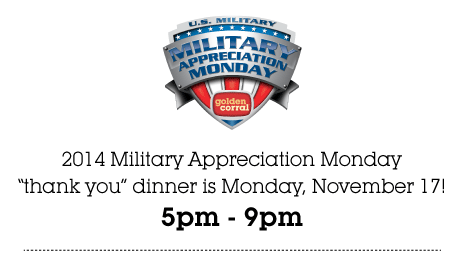 All Golden Corral restaurants nationwide participate in this event to honor our military heroes, past and present. Click here to find a Golden Corral near you. Next postHalf Price Books 40% Off Coupon Begins TODAY! Print Yours Now! !